Teeth bleaching, also known as teeth whitening or tooth lightening, for brilliant white teeth in our dental practice in Rojales, Torrevieja close to Alicante in Spain. Teeth Whitening, also known as teeth bleaching or lightening, can remove tooth discolouration and produce brilliant white teeth. 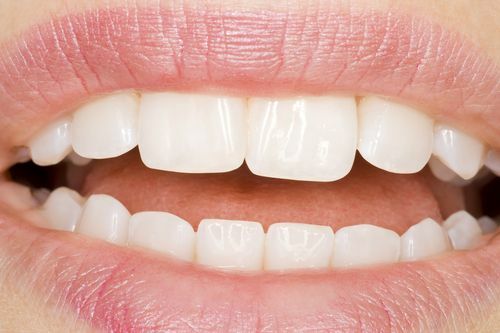 Beautiful, natural looking white teeth definitely contribute to an attractive appearance. Especially in today’s society white teeth are associated with vitality, physical health and success. Teeth whitening is more than lightening of the teeth. First, tooth discolouration caused by the consumption of coffee, tea or tobacco are removed with Dental Hygiene / Teeth Cleaning. This also helps to protect the gums since a professional teeth cleaning can reverse inflammations of the gum. Therefore, bleaching or whitening of the teeth is always carried out following a professional dental hygiene. Your teeth return to their original colour. According to your wishes they can even be whitened to a lighter colour than they were originally. When is bleaching or whitening advisable? For aesthetic reasons teeth whitening always is advisable. Especially if you wish to have whiter, more beautiful teeth and a bright smile. Before the insertion of Dental Inlays and White Fillings. If you are going to receive a filling or crown, it will be matched to the current colour of your teeth. So if you are considering a teeth whitening in the future, please be aware that a filling or crown cannot be whitened afterwards. Better go ahead with the whitening before getting new teeth! The same applies to the insertion of Dentures / Prosthetics, Dental Implants, Dental Veneers. In-office whitening or home whitening? In our dental practice we mainly work with in-office whitening (also known as chairside whitening or in-office bleaching). This means your teeth are whitened directly in our office. The advantage is that the whole treatment can be monitored and controlled by us and is completed in only 90 minutes. Thus, we can make sure that the results are satisfying. Above all, the results are immediately visible. Home bleaching: Upon request we can also supply you with two mouth trays (for upper- and lower jaw) so you can whiten your teeth at home. Experience however, has shown that the home bleaching method is regarded as tedious by many patients (although it also achieves great results, if carried out consequently). We only recommend home whitening if you have enough spare time and are very disciplined in the process. 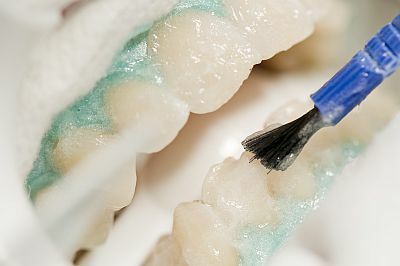 Advantage of home whitening: You can re-use the trays at a later stage for another teeth whitening if you feel your teeth need a new white shine. In our dental practice we use the Easy White whitening system of the German company Delta Med (35% hydrogen peroxide) in combination with a plasma lamp by Schütz Dental (Crealight) in order to achieve best results in a gentle way. Thus, you can enjoy your white teeth for as long as possible. How does the whitening gel work on teeth? 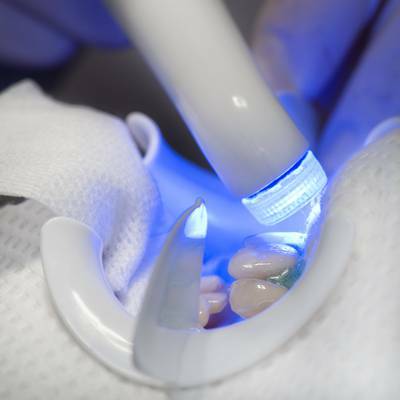 The plasma light activates hydrogen peroxide, the active ingredient of the whitening gel and thus supports the chemical reaction between the whitening gel and teeth. When the hydrogen peroxide breaks down, oxygen permeates into the dental enamel and dentin and whitens the teeth without altering the dental substance. With our professional teeth whitening system, you get a beautiful white smile just within 90 minutes. Preparation of teeth and gum. All parts that should not get in contact with the whitening gel such as lips and tooth gum are safeguarded with a silicon mask. Application of the whitening gel on the teeth (Easy White by Delta Med). Activation of the whitening gel with the plasma light followed by 15 minutes reaction time. Step 1 and 2 are repeated 2 more times (bleaching gel application, activation with the plasma light, 15 minutes reaction time). Application of a protecting gel for 5 minutes. Rinse mouth with water and admire your perfectly white teeth! You can go home and enjoy your new smile! What do I need to pay attention to after teeth whitening? Right after teeth whitening – for about two days – you should not drink coffee, red wine, Coke or tea and not eat carrots, beetroot or any other colouring food. Smoking should be avoided. This makes sure that your whitened teeth remain white for a very long time. Considering that a slight darkening of the teeth in the first days up to two weeks is normal, it is advisable to „overbleach“ the teeth to a slightly lighter colour than initially desired. If you stick to the simple recommendations for dental care after teeth whitening, your teeth will always remain whiter than before and will only darken a little after 3 to 4 years at the earliest. In order to keep the beauty of your teeth, we recommend to brush your teeth twice a day and to use dental floss or interdental brushes. Also, professional dental cleaning twice a year is necessary on a regular basis.